Preparing for a new blog series. Hello Everyone! How are my crafty friends doing today? I hope well. I have to say thank you so much to all of you who left comments last week. I promise to visit any of you that I missed this week. I am feeling happy today. I just started working on a new blog series for this site. the name of it is, “Confessions of a Scrapbook Kit Hoarder“. It will be so helpful for me to move me through my creative hoarding habits into a more productive crafter while at the same time sharing my creative process with my readers. So what you see on my desk is the beginnings of the planning process. So if you are interested in seeing if I can kick the hoarding habit, do check back on the site regularly to see the cool projects I can come up with using my kits. (Yes, that would be a shameless plug and I apologize. However the more people that read, the more likely I will honor my commitment and create more with my kits.). Oh and do you see my new toy in the middle of the table? I bought the WeRMemoryKeepers 3×4 punch. It cuts photos and papers to 3×4 and rounds the corners too. Perfect for the Page Protectors in my Project Life. I am off to come visit your desks! 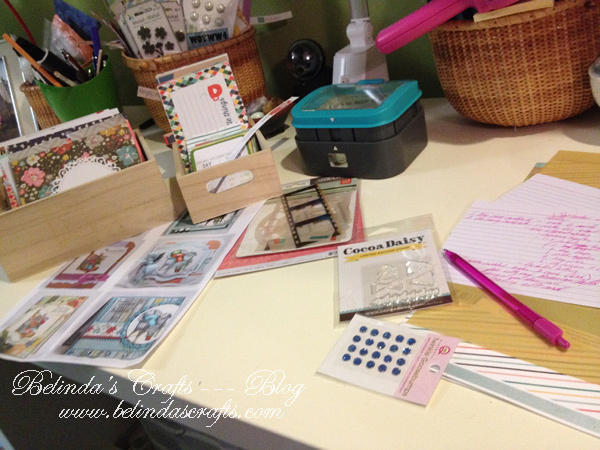 Previous PostConfessions of a Scrapbook Kit Hoarder…The Intervention! I love getting new toys to play with, yours looks interesting never seen one before. Oh and good for you in the kit hording challenge, I will be stopping by to see how you fare. I have the same issue with hoarding kits…only they are digital so don’t take up any room lol. Love your blog. well done you for tackling all that hoarding but you shouldn’t feel too bad about having all that stuff, we are all in the same boat but some of us don’t admit it. Good luck on the planning and excecution of the plan! I think we’re all hoarders at heart, look at my caddy!! But it’s good to use up things we have before buying more… or things we have at the same time as buying more, lol! I’ve been buying pre loved stamps on Ebay and putting them by for Christmas, and it’s only October! I love to emboss and use it a lot, 10 of the 11 cards I made for WCMD have embossing on them, I posted them earlier this week if you’d like to take a look. Hope you get your Fall cards finished soon. Lots of goodies on your desk! I wish you all the best with your series and challenge for yourself. I am not a scrapbooker, but have been known to horde my favorite card making and stamping supplies. I have been better this year about using them lately. Your area looks nice and neat! Honestly, I don’t know a crafter that isn’t some sort of hoarder…. I thought it was a qualification? I agree totally that it is a qualification. I mean really I can’t help it that I need to have all the awesome products out there despite the lack of time to even use them! !